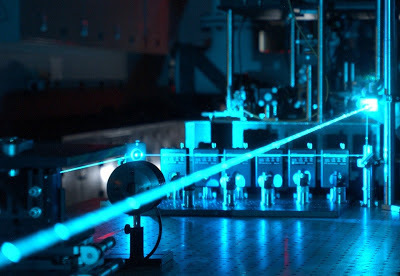 Researchers at the National Institute of Standards and Technology (NIST) have "teleported" or transferred quantum information carried in light particles over 100 kilometers (km) of optical fiber, four times farther than the previous record. The experiment confirmed that quantum communication is feasible over long distances in fiber. Other research groups have teleported quantum information over longer distances in free space, but the ability to do so over conventional fiber-optic lines offers more flexibility for network design. The experiment used photons to transfer the information. A photon is a single particle of light. It is an elementary particle that exhibits both particle and wave properties; wave–particle duality. The study of photons usually falls under but not limited to quantum mechanics. Photons have many real world applications. Solar energy cells use photons to convert sunlight to energy. Some systems like the Single Photon Emission Computed Tomography (SPECT) use it to generate images. The mass of photons was one of the factors that lead researchers at CERN in the Large Hadron Collider to help discover the Higgs Particle. Even in science fiction, the photon torpedo or photon gun is part of a spaceship's arsenal. Not to be confused with Star Trek's fictional "beaming up" of people, quantum teleportation involves the transfer, or remote reconstruction, of information encoded in quantum states of matter or light. Teleportation is useful in both quantum communications and quantum computing, which offer prospects for novel capabilities such as unbreakable encryption and advanced code-breaking, respectively. The basic method for quantum teleportation was first proposed more than 20 years ago and has been performed by a number of research groups, including one at NIST using atoms in 2004. The new record, described in Optica,* involved the transfer of quantum information contained in one photon--its specific time slot in a sequence-- to another photon transmitted over 102 km of spooled fiber in a NIST laboratory in Colorado. "Only about 1 percent of photons make it all the way through 100 km of fiber," NIST's Marty Stevens says. "We never could have done this experiment without these new detectors, which can measure this incredibly weak signal." Until now, so much quantum data was lost in fiber that transmission rates and distances were low. The new NTT/NIST teleportation technique could be used to make devices called quantum repeaters that could resend data periodically in order to extend network reach, perhaps enough to eventually build a "quantum internet." Previously, researchers thought quantum repeaters might need to rely on atoms or other matter, instead of light, a difficult engineering challenge that would also slow down transmission. Various quantum states can be used to carry information; the NTT/NIST experiment used quantum states that indicate when in a sequence of time slots a single photon arrives. The teleportation method is novel in that four of NIST's photon detectors were positioned to filter out specific quantum states. (See graphic for an overview of how the teleportation process works.) The detectors rely on superconducting nanowires made of molybdenum silicide. ** They can record more than 80 percent of arriving photons, revealing whether they are in the same or different time slots each just 1 nanosecond long. The experiments were performed at wavelengths commonly used in telecommunications.